← How Do I Review A Yoghurt? As a man, I own many socks. Some of them even have a matching sock, a pair if you will. I’ve had lots of pairs of socks come and go; they differed in colour of course and some were thin cotton while others were thick wool. My sock collection ebbed and flowed through the years influenced by what my aunt wrapped for me at Christmas (a cliché yes, but a useful one) or what happened to be closest when a girlfriend said “you could do with new socks” while shopping. As a man I wouldn’t normally give any thought to choosing socks, there’s bigger things to worry about in life, like cider. However, I am no longer a normal man. I am one of those rare breed that find pleasure from climbing mountains, so I’ve known of the existence of “technical” socks for some time. I even own a few pairs, they were thick and woolly and promised to make molehills out of mountains and cost 8 times what a normal pair of socks would cost. When I started running I carried this desire for “technical” socks with me and a few years ago (pre-marathon 2011) I was given three pairs of socks that promised to be good for 1000 miles each. That’s 3000 miles, and I can’t have run more than 2,700 since then, so I hadn’t given any thought to purchasing any more running socks just yet. Then a few weeks ago, when my friends at On Running sent me a pair of their shoes to review, I posted a photo of me wearing them on Twitter. Within seconds the good people at Fitbrands contacted me to say “nice shoes, but what the hell are those cotton monstrosities on your plates of meat, you need some proper socks, and fast” or words to that effect. Two days later I received a parcel with some socks in, and the address label wasn’t written in my aunt’s handwriting. Balega’s Drynamix keeps your feet cool and dry in a really scientific way, like a technical t-shirt, on your feet. 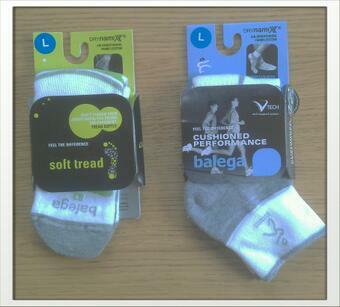 Balega’s this and that design trickery means the bits that wear out in your other socks won’t in these, simple. Balega socks are anatomically crafted to make them feel all bouncy and quick, even before you’ve pulled your shoes on. So, there’s some wildly audacious scientific sock claims, what’s the reality? These socks are game changers. I’m reasonably certain I have never before put on a pair of new socks and made an audible noise of appreciation. Ever. Yet from the moment I slipped on the Soft Tread pair and sighed contentedly I knew I’d hit gold. I can’t recommend these socks enough, so I won’t try, because you really should have the idea by now. The “Soft Tread” are now my sock of choice for trail running thanks to the extra cushioning they offer. The “Enduro 2” pair are the go to footwear for long days of pounding pavements, light and dry but superbly bouncy. Can you believe I’m writing like that about socks? No, me neither, but that’s how good they really are! I’ve even acquired a further pair of Balega socks, the “Second Skin” model for short, fast runs and they are so thin and fresh I don’t understand how they can be so comfy. In conclusion, not all socks are created equal and if you run then I really do recommend investing in something amazing for your feet as well as your £100 trainers, because you wouldn’t put biodiesel in a Ferrari…and you are a Ferrari my friend! This entry was posted in Kit, Running and tagged Balega, kit, review, running, Socks. Bookmark the permalink. I’m an avowed sock snob (and with full disclosure, a sock snob who works at a running store…. so many a sock I’ve tried.) A sock can make or break a run, so yesh! Take socks seriously. Please try Feetures Elites and, truly, the Feetures Elite Merino Wool blend IS world peace in a sock. Really. It’s all very well offering World peace, but you may have just started sock wars! ;o) Thanks for reading Christi.